As 2015 has begun, I’ve been filled with this desire to be faithful to God. But what does that mean? As I’ve reflected on all the uncertainty in my own life and the world, I continue to struggle with trusting God with the future and what is beyond my knowing. When I picture the future, my wildest dreams still sometimes tend toward anxiety, and I begin to worry, doubt, fear, and breed resentment. I know these are not faithful feelings, and I worry that I’m just not cut out for this life of faith. 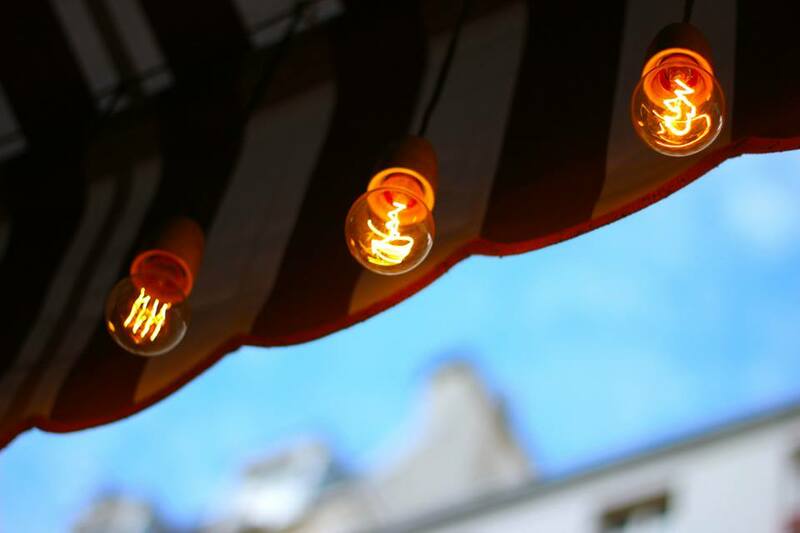 Awning and lights in Paris, France. All photos by Evan Schneider. But I’ve also realized something. When my daughter cries, I turn without thinking to wrap her in my arms. When a student in front of me needs counsel, I listen intently and reply with carefully chosen words. When those around me are hurting or in need, I lift them up in prayer, and I strive to serve them. When it comes to one moment, I think I can be faithful. I can be faithful with this moment rather than fearful of what I do not know. And suddenly faithfulness becomes not something unattainable or fleeting, but a daily practice of breathing and walking with the God of this moment. 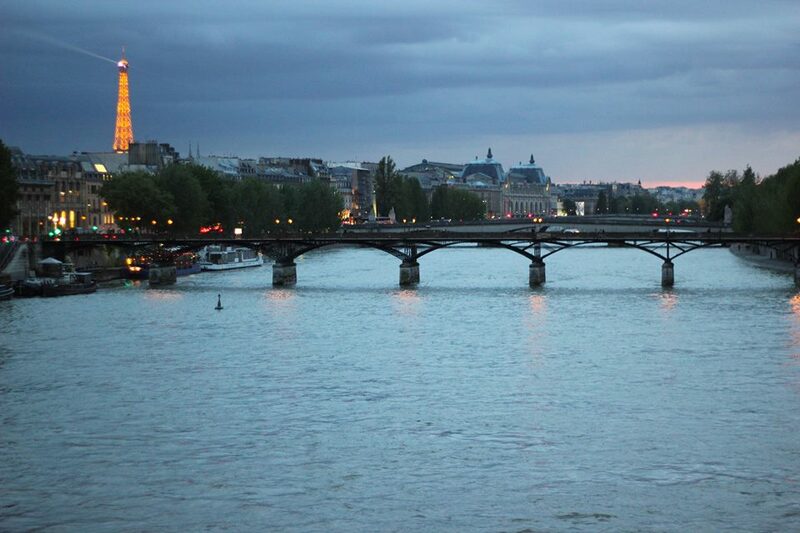 The River Seine at night. I love letting others know that when the world and uncertainty fill them with doubt and fear, there is reason to trust otherwise. I love believing in a God who is invested so deeply in our lives, in making us capable, faithful people, rather than leaving us to our own devices. And I love knowing that faithfulness isn’t just about some lofty goal or distant future, but is the stuff of now, of taking care of this moment, with God never far away. Remember how I shared with you that God has been teaching me a bit this past year about how to be content, like the apostle Paul, in all circumstances, and how I’ve learned that life is so much more full of possibility with God at the reins? I’m happy to report that I have a draft of my dissertation–all five body chapters–and am working to make revisions to these before the baby comes. Throughout the pregnancy, even though I haven’t felt great, I’ve been really active, continuing my normal runs (albeit shorter and slower) along the canal, and I’ve had a fair amount of energy, which I’ve been really thankful for. The D & R Canal in the snow. Still, it’s been discouraging to hear unsolicited advice and comments from strangers or acquaintances warning that I’ll “get nothing done after the baby comes,” or that the energy, productivity, and passion that I have for my dissertation project will necessarily fall by the wayside. I can’t anticipate what it’s like to have a baby. I imagine it will be an uncanny mix of exhaustion, joy, and fear, and schedules and priorities will necessarily have to shift, but I have no way of knowing what’s really coming. It’s a completely new experience for my husband and I, and so these comments have, on occasion, sprouted little seeds of doubt about myself and the life and passions I seemingly will have to give up for a new baby. I’ve been noticing, however, that I’m not a stranger to the unknown, and that through all the unknowns in my life, God has been decidedly faithful, providing possibilities I, myself, could have never foreseen. It’s been helpful as I approach the unknown of having a child to remember how my husband and I felt, for instance, before going to live in China. We had no idea what to expect, and yet, we prepared as best we could, seeking counseling, reading books, imagining potential conflicts, difficulties, and pitfalls, as well as looking forward to the excitement of a new experience. 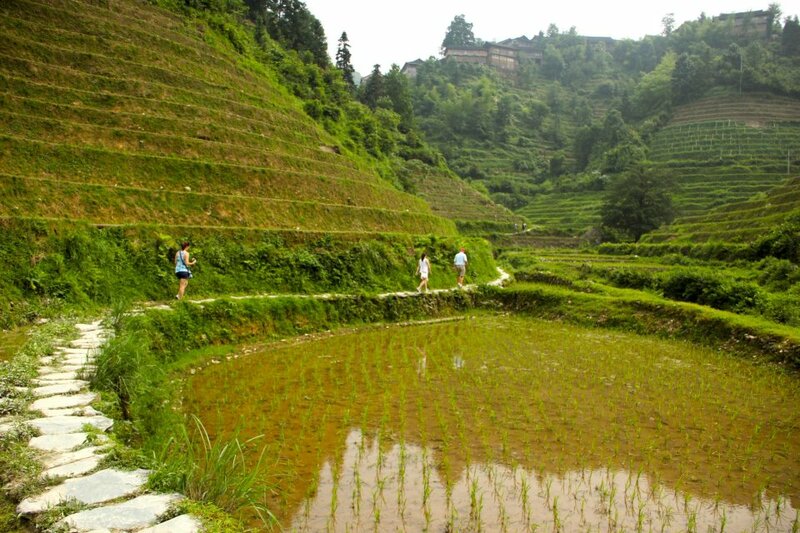 My family hiking in the rice terraces outside Guilin, Guangxi. Photo by Evan Schneider. 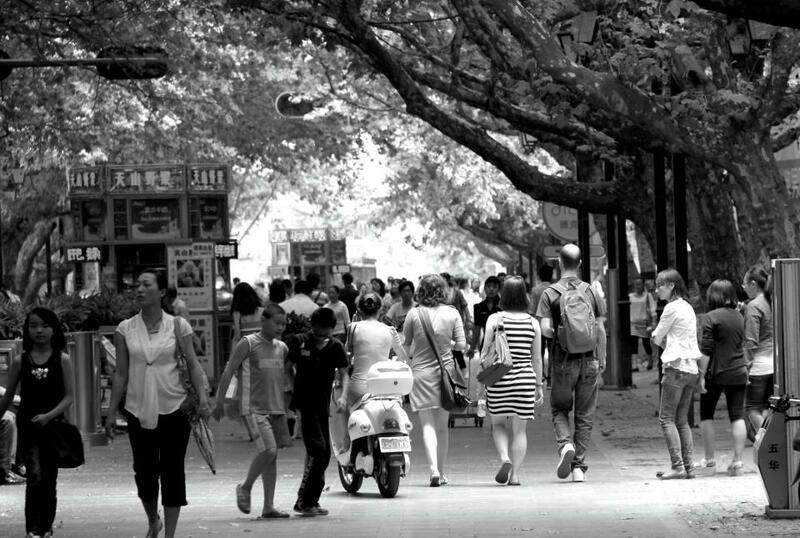 Those of you who have been reading my blog for sometime may recall how much the experience of living in China surpassed my expectations and deepened my relationship with my husband, God, and others. 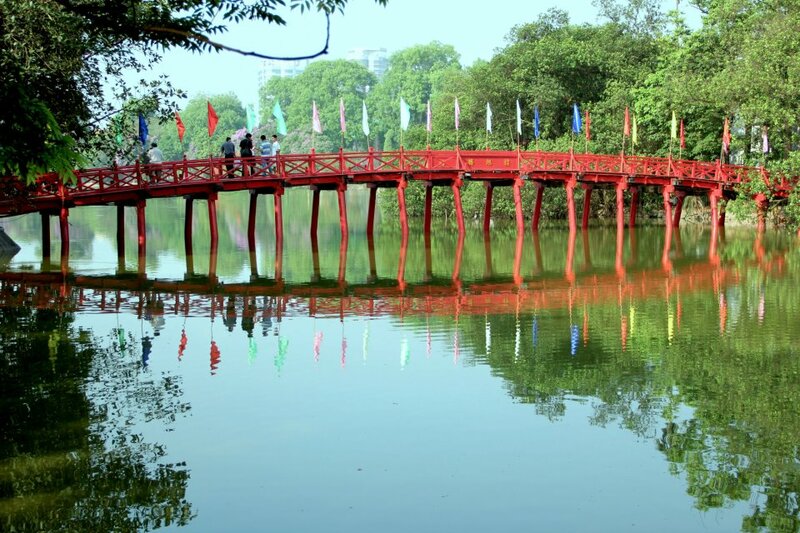 There were definitely moments that my husband and I didn’t anticipate (stressful visa issues, our entire apartment flooding, the general wear and tear of trying to assimilate to a culture and speak a language that wasn’t our own), but overall, I felt closer to God in China than ever, I made lasting relationships with incredible people, and I think that challenge even strengthened my relationship with my husband. I recently read a blog post about productivity from Zen Habits in which the author describes anxiety as a lack of trust in the future. While I think this makes sense, I don’t necessarily see a reason to trust the future per say, but I do want to be a person who trusts God with my future. God sees possibilities for us that we can’t, but we often struggle to let God be God when it comes to the future. For instance, the teaching experience that I just completed at Drew that was so formative for me wasn’t even on the radar until summer last year. If I had panicked and chosen something else, I would have missed out on one of God’s possibilities. It’s funny how this kind of trust in God can impact not just the future, but the present. For instance, when I realized that the negative voices of strangers often came from a place of anxiety themselves, I gradually began to also hear the confidence and encouragement of friends who know me well. My spiritual director told me she’d never been more productive than when she had a newborn who slept all the time, my advisor never wavered from believing that I could complete both a dissertation and have a baby, and my friends only seem to be more supportive of me now that my husband and I are embarking on this new season in life. It means so much to have God using these friends and mentors to remind me who I am during this time. 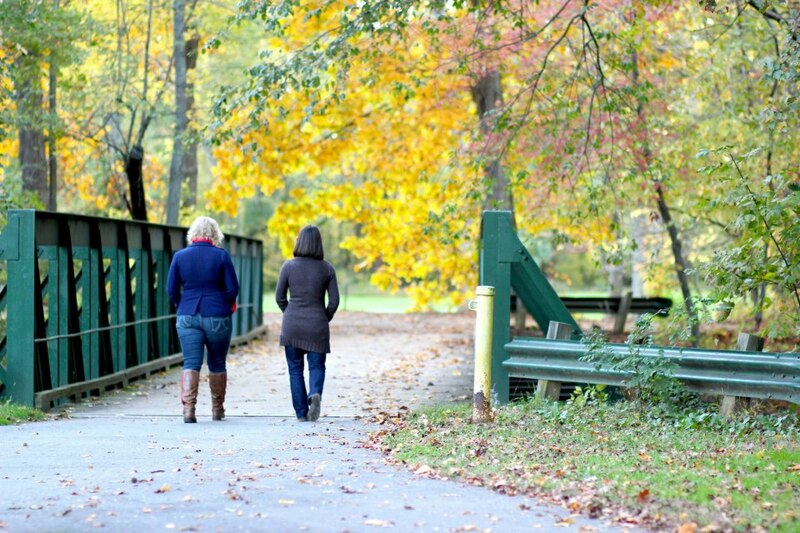 Walking on the towpath in Princeton with a dear friend. 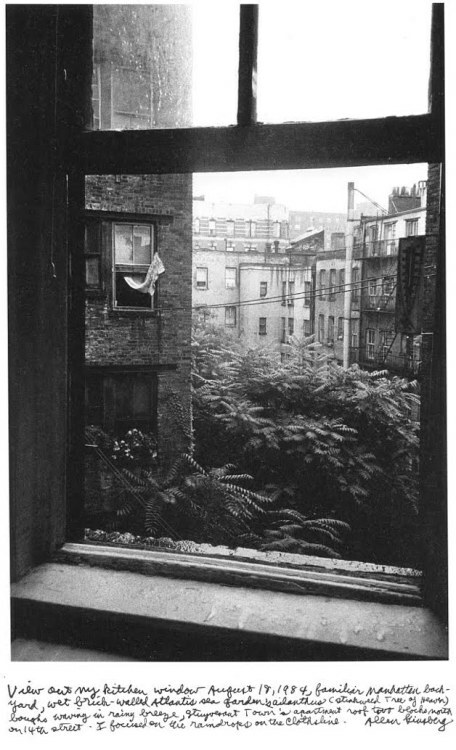 Photo by Schneider. I love a challenge–I always have, from that first trip to Mexico in high school to our life in China, to writing a dissertation, and finally having a baby–these are all things that at one point seemed impossible that God made possible. And so here I am, over eight months pregnant, working on a dissertation, expecting a baby, and wondering what possibilities God has in store for this coming fall. And with God by my side, I hardly feel anxious. It’s this challenge of faith, trusting the future to God, and leaning on God to yield contentment and peace in the present, that’s keeping me grounded, confident, and filled with gratitude. I don’t think contentment is about sliding into complacency. On the contrary, it’s about living faithfully with the uncertain, another challenge that God’s been guiding me through these past years. I just keep marveling on how much God can do with our lives when we bow them at God’s feet rather than wresting them from a God who wants to show us possibility. How do you trust God with your future? How do you find contentment in your present? How do you worship God with your life? It’s been a whirlwind few weeks, from the great plains of Oklahoma, buying a car, insurance, and learning (or should I say not really learning) how to use our smart phones. And then packing up that car and driving it some 1500 miles cross-country, in the good-old great American road trip fashion. I love routine, because it keeps me balanced and aware. Writing this blog has added to that discipline of seeking to be aware of God in every moment, so I’d like to attribute my lack of connection with God as of late toour transience and our busy-ness. To do so would be not only dishonest, but also misleading. The fact is, God is everywhere and in everything (after all I managed to adjust to my unpredictable fieldwork and life in China), and even if there truly are more distractions here in America, it is I who choose to be distracted by them. In the moments where I’ve been present with God, God’s presence has also been palpable. Like at my dear friends’ wedding this past weekend, where I had the honor of praying for the the bride before she walked down the aisle and praying the blessing at the reception. And so many friends and strangers, from so many walks of spirituality, came up to me confirming God’s presence in those moments. Or the funny little discipline my husband and I found in reading Amy Chua’s Battle Hymn of the Tiger Mother aloud to one another on our road trip, and pausing to discuss Chinese culture, life, and relationships. Or regarding God’s breadth and goodness as I hear my professor’s husband confirm that God must have heard our prayers for his cancer from China, because his progress has been steady, his condition remarkably stable. But there have also been too many moments where I’ve referred aloud to God’s provision as luck, when I’ve tucked my faith and my vulnerability out of earshot, not wanting to burden anyone with the fact that I’m not sure how well I’m doing with being back in the US, or admit that I’ve spent less time talking to God as of late, and I’m wondering what to say or how to pray. So I’m confessing here that I’m all too often an expert at how not to speak of God rather than how to, and that doing so, even for a budding minister, is difficult, risky, important, and takes practice. And while I’m feeling disappointingly aware of the moments where I should have spoken up, and the moments where I’ve failed, I’m also feeling confident in God’s presence, despite my absence. And this evening I’m trusting in God’s ability to keep growing me toward God and others this day, tomorrow, and in the future…wherever that may be. Warning: International move in progress…and shown, along with reverse cultural shock, to also have side effects of extreme sappiness. Please humor me these next couple of weeks, dear readers! 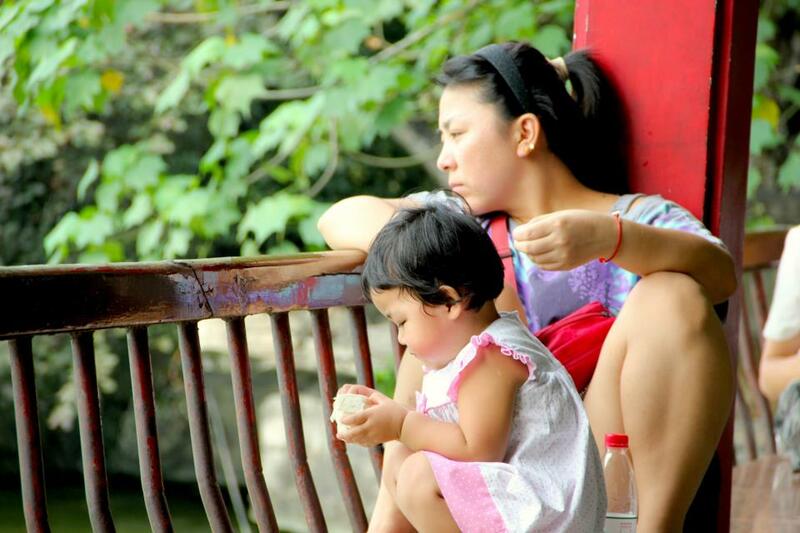 Feeding the fish in Guangxi, Guilin. Maybe things aren’t working out perfectly, and maybe they’re even about to get really, really hard, but just as there’s been grace for moments like these, I’m reveling in the peace, God’s peace, that’s been washing over me these mesmerizing last days in China. Walking with friends in downtown Yunnan, Kunming. It’s such a peace that’s got the husband and I dreaming with a reckless abandon (rather than worrying with wracked paralysis!) about what’s in store for the future. As we sort through two years of papers and research and clutter and life here, I find myself looking over at him and being ever so thankful for his goodness, his curiosity, his companionship. 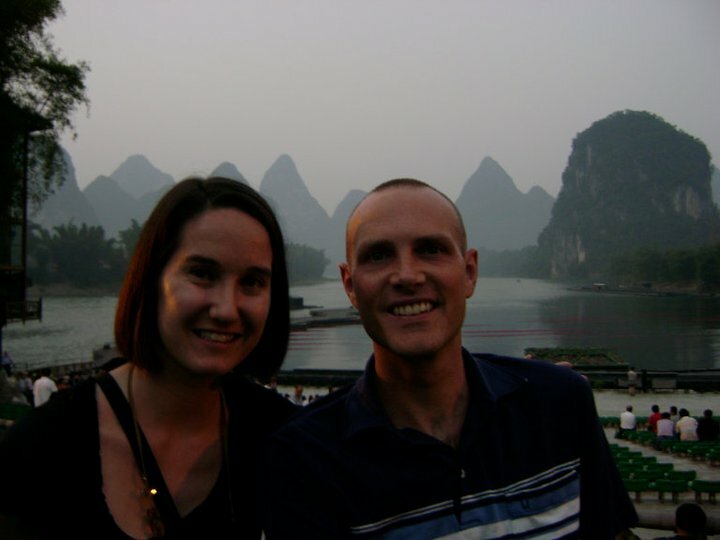 Evan and I in Guangxi, Yangshuo on our third anniversary. As I walked back to the orphanage the other evening with one of my Chinese friends I told her the gist of how my husband and I got to China, how it was he, who ten years ago came here for two summers and found himself drawn to the culture, the people, and the place. But in varied twists of fate, he never made it back, and went sifting through a bundle of doubts and questions and frustrations and miraculously through all of it found his way to seminary. And as we became friends, fell in love, and eventually married, he told me of that dream to return to China and his passion captivated me as well. So without knowing that the seemingly rash actions I took at the time–enrolling for Chinese 101 with the undergrads and beginning this study of Chinese foster mothers despite the plans I had to write my dissertation on Mexican women in the Pentecostal movement (I’ll get to that project one day! 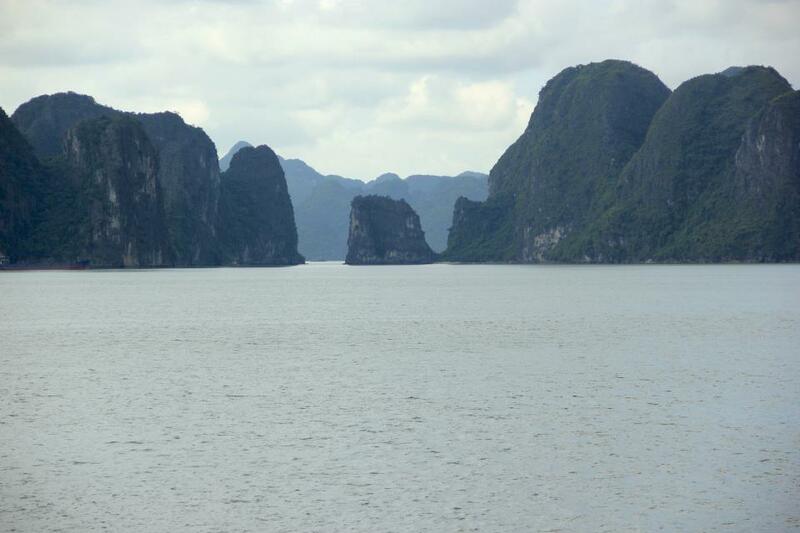 )–were the stuff of faith, I began to feel my way toward this place, China, as well. 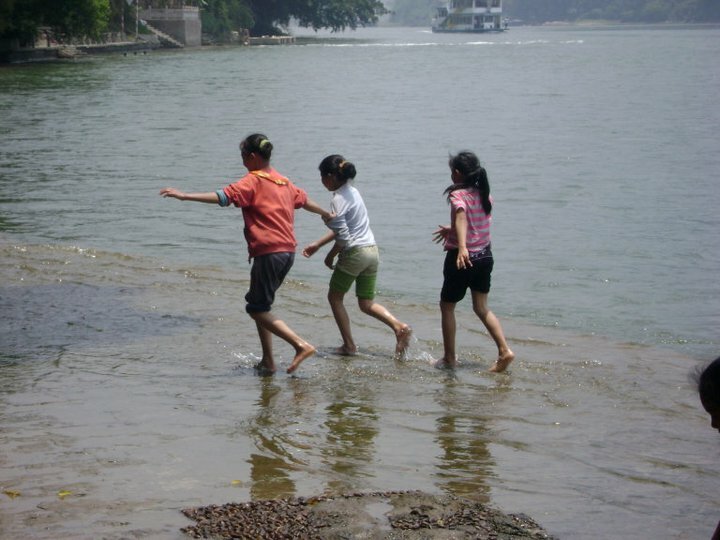 Girls playing in the Li River, Guangxi, Yangshuo. And as I told this story to my friend the other evening I said that I’m not too certain of many things in my young life, but despite the wildness and the difficulty of it all, I’ve always been fairly certain that Evan and I were meant to go to China together. It’s funny because when we first got here, everyone we met in China wanted to know if it was Evan who followed me here or the other way around, and despite my incessant claims that we’d very much come here together, because we both wanted to be in China, I could tell that didn’t make sense to them, not grammatically, not culturally, not logically. 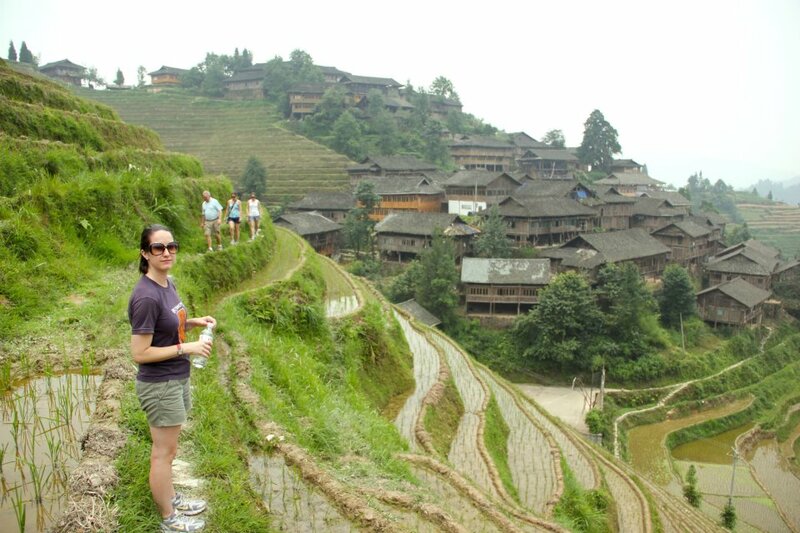 Hiking the rice terraces with my family in Guangxi, Zhongliu, June 2012. So it is that peace comes to us, surpassing all understanding, and settling into the cracks of ill-conceived plans, pushing aside our greediness for things like power and security, and our obvious limitations. And so people who need each other find each other and not logically or fantastically, but quietly and providentially. And peace lives and breathes in a place where faith is rich and alive, and the rest is just details. That place, for my husband and I, has been China. 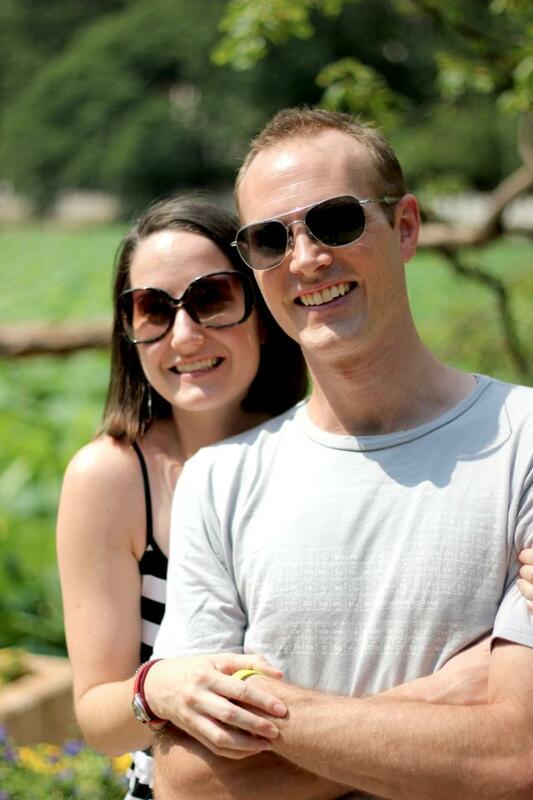 My husband and I in Green Lake Park, Yunnan, Kunming, June 2012. Where have you found peace? And what has God made you certain of this day?